In the very late 1800’s, Victorian ladies began having teas for mommy but not till after the baby was born because pregnant women did not appear in public. In the early 1900’s, the teas transformed into “showers” (based on the “showering” of the bride before her marriage) and umbrellas became symbolic because it was customary for ladies to carry parasols when they attended these afternoon gatherings. Almost all of the gifts were handmade except the silver that was given to the babies by the grandmothers. Thank goodness for those Victorian ladies! My first shower was actually a tea given by Rachel, Obea, Kim, and Laura. Everything was absolutely beautiful. From the flowers to the food to my favorite, the mint iced tea. Obea’s mother-in-law even allowed us to use her china for the occasion. I cannot get over how generous everyone was. At the tea party, everyone arrived looking like a million dollars. Aunt Carol even asked if all my friends were beautiful. Upon arrival, everyone was given a number – actually one of Davis’s birthdays – and asked to write a birthday note to be opened on that particular birthday. I watched as some people excitedly penned their best birthday wishes and advice. There were others who were left feeling overwhelmed by this activity. Kathleen for example looked like she was having a moment of total dread. I walked over to ask which birthday she had been given. “SIXTEEN!” I told her to write things that swayed him away from girls. I left Kathleen and returned awhile later to see if she had made any headway on her well-wishes. She had – she had written, “Dear Davis,” That’s it. After much pondering over birthday advice, people then made their way to the food table. Yummo! The food was delectable – everything was great, from the tomato basil tarts to the chocolately chocolate cookies – wow! After eating, the attention was turned to me and my gifts. Everything was going quite well, until I came to Tracy’s mom’s gift to Davis and me. I reached into the gift bag and pulled out a piece of paper tied with ribbon. 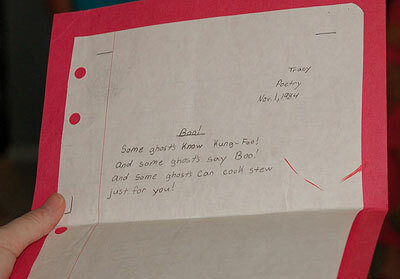 When I opened it, I found a poem that Tracy had written in second grade, entitled “BOO!” (see below). As you can see, it’s a silly little second grade poem – nothing to get emotional over. But, the fact that it was in Tracy’s second grade handwriting and those were his second grade words, got the best of me. I couldn’t even read it out loud. Kim finally read it and it brought tremendous laughs from everyone. She also gave me some of his best drawings. Immediately afterwards, I opened a present from Kim which was a bonnet/handkerchief. There was a note attached explaining that you bring it home with Davis from the hospital. Then it continued to say that he gives it to his wife on his wedding day. Mercy – how much can one pregnant woman take. It was all very overwhelming. I cannot believe how gracious and giving everyone was. It was like being a little kid on Christmas morning. My most recent shower was a cookout at the Floyd Farm. Tracy’s whole family was there minus Aunt Janice and Uncle Homer. We feasted on wings and salads and CAKE! Again – Yummo! This shower was a little different than the tea. We actually played a few shower games. Everyone had to guess the size of my belly by measuring off a piece of ribbon. It was interesting watching some people roll and roll and roll the ribbon off. You definitely get a sense for how super large people think you are. Tracy’s dad actually rolled off ribbon, wrapped it around his waist, left a little extra room, then cut and tied it. He was way off – much too long. Brant actually won this game. I am especially thankful for the people who underguessed my size. Tracy’s aunts also thought it would be cute to see which person could buy me the ugliest outfit. I wasn’t in on the joke, however, so I just kept opening these outfits and graciously thanking everyone for their thoughtfulness. We got a camouflage onesie, a onesie with a rebel flag that says pee all you can pee, camo pants with a “matching” striped onesie, and my favorite an Elmo sports ensemble. After the shower was over, Tracy and his dad assembled Davis’s new ride – his stroller. I love throwing parties for special events or showers for other people, because I love being in the kitchen – behind the scenes. But, for some reason having a party thrown in my honor is a little overwhelming. First of all, before the party, I always wonder if anyone will show up. I guess I just figure people have more important plans and better things to do. Secondly, when people are there, focusing all their attention on me, I really don’t know what to do with myself. That’s when I usually say dumb things that get me into trouble. Finally, the whole idea of receiving is difficult for me. I always feel that if someone gives me a gift, I have to repay them somehow. I know all this sounds crazy, but that’s just the way I have always been. So, these showers leave me at a loss. I am just extremely thankful that we have so many people that care so much about us and Davis. What a lucky little boy he is going to be. Michelle and Tracy – the showers are just a thank you gift for giving us all a greater gift – a wonderful new part of you both. I am sure that you have your bag packed, right. And which outfit will Baby Davis come home in????? I know you cant wait for him to wear the stripped oneise and the camafloge pants. Previous Previous post: Yee Haw Grandpaw!